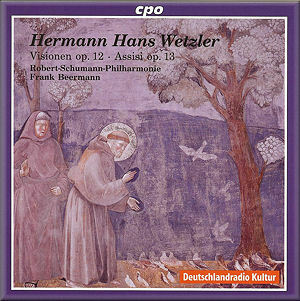 Herman Hans Wetzler, a post-romantic German composer is represented on this CPO release by two of his extensive orchestral works - Visions op. 12 (1923) and Assisi, Legend for Orchestra, Op. 13 (1925). Wetzler was born in Frankfurt, Germany and lived most of his life in Germany, Switzerland or the United States. His musical education took place mostly in Frankfurt and included lessons with Humperdinck - perhaps even Clara Schumann. In 1892 while in New York City, he took on various musical roles and even established his own orchestra, the Wetzler Symphony. Richard Strauss premiered his Sinfonia domestica at a Wetzler-sponsored concert in 1904. Wetzler returned to Germany in 1905 to pursue a conducting career which never really took off but did produce brief stints in such places as Riga, Lübeck and Cologne, where he conducted alongside Otto Klemperer. From 1929 to 1940, he lived in Switzerland and after 1940, moved back to New York City where he died in 1943. Visions is scored for a large Wagnerian-size orchestra and consists of six small tone poems: Introduction; Adagio (inspired by a Michelangelo sonnet); Scherzo demoniaco; Intermezzo ironico; Fugato and Risonanza estrema. Some of the musical styles and highlights include a Stravinsky-influenced Introduction, a very tranquil Adagio where the world of Wagner’s Tristan meets the dreamy passages in Richard Strauss’s Ein Heldenleben, Don Juan and the Alpensinfonie. The Scherzo demoniaco centers on the figure of Charon from Dante’s Inferno - Wetzler himself outlined the themes behind Visionen - and the music inhabits the sound-world of Strauss, Wagner as well Respighi and Dukas. I detect even hints of cinematic music à la Korngold and Hermann. The Intermezzo is full of Gallic touches sprinkled with echoes of Manuel de Falla’s Spanish landscape music and an “oriental” segment reminiscent of Puccini’s Turandot. The Fugato is full of bustling string energy and once again we are not far away from Strauss’s Till Eulenspiegel. The Risonanza that concludes the work comes close to Wagner’s Parsifal and is like an arch, slowly building to a rousing fortissimo at 5.08, with some themes from the previous Adagio also being recycled. This is followed by a return to the opening with a serene and peaceful ending. The visions have ceased. Assisi, Legends for Orchestra is also in six movements and is a musical portrait of the climb on Easter Sunday by St. Francis; Wetzler had visited the Ereme delle Carceri monastery and was moved by his stay. Einsamkeit (Solitude) is a musical description of St. Francis’s deep thoughts and the piece is scored largely for strings and low woodwinds. It has a polyphonic, dense structure. The notes refer to the movement as being “reminiscent of Schoenberg’s Verklärte Nacht” - to my ears it is still Strauss/Wagner type string textures. Trauerglocken (Mourning Bells) is strong music with martial overtones and prominent parts for bells, snare-drums and other percussion. The next two pieces, Ostermorgen (Easter Morning) and Vogelpredigt (Sermon to the Birds), form the main part of the work. Musical nature-painting motifs envelop the two movements. Ostermorgen is reminiscent of Forest Murmurs from Wagner’s Siegfried, with solo violin and flute playing a woodland “pas de deux”. The solo cello represents St. Francis and once again woodwinds (mostly flutes) take the part of the birds; the music is far removed from the world of Messiaen and closer to Liszt’s Legends. The Schwester Sonne (Sister Sun) movement reminded me of Respighi’s Pines/Fountains as well Strauss’s Alpensinfonie and Wagner’s Das Rheingold with a shattering fortissimo at 1:10. Bruder Tod (Brother Death) harks back to the opening Solitude movement and has passages like Siegfried’s Tod from Götterdämmerung. The playing by the Robert Schumann Philharmonic is impressive - assured, weighty, engaging and thoroughly in with the music thanks most likely to maestro Frank Beermann - expect to see more from them this year in anticipation of the 200th anniversary of Robert Schumann’s birth in 1810. Informative booklet notes on Wetzler’s life and music are by Heinrich Aerni. The recording is lifelike with ample bloom and detail around the instruments - I was impressed by the vivid percussion segments in both pieces. CPO needs to be commended for supporting such repertoire and kudos to all concerned. If you want to hear post-romantic music cut more or less from the same cloth as the tone poems of Richard Strauss, late Wagner with sprinkles of Respighi, Dukas, Magnard (perhaps even Alfvén, Bax and Bridge) and early Stravinsky, then look no further. Musically he is very similar to the other German post-romantic composer, Ernst Boehe, whose massive 85 minute Odysseus cycle across two discs is also available from CPO. A splendid discovery for those with a keen ear for the byways of the post-romantic and early 20th century tonal orchestral world.